Case studies and small trials suggest that acupuncture may effectively treat hypertension, but no large randomized trials have been reported. The Stop Hypertension with the Acupuncture Research Program pilot trial enrolled 192 participants with untreated blood pressure (BP) in the range of 140/90 to 179/109 mm Hg. The design of the trial combined rigorous methodology and adherence to principles of traditional Chinese medicine. Participants were weaned off antihypertensives before enrollment and were then randomly assigned to 3 treatments: individualized traditional Chinese acupuncture, standardized acupuncture at preselected points, or invasive sham acupuncture. Participants received ≤12 acupuncture treatments over 6 to 8 weeks. During the first 10 weeks after random assignment, BP was monitored every 14 days, and antihypertensives were prescribed if BP exceeded 180/110 mm Hg. 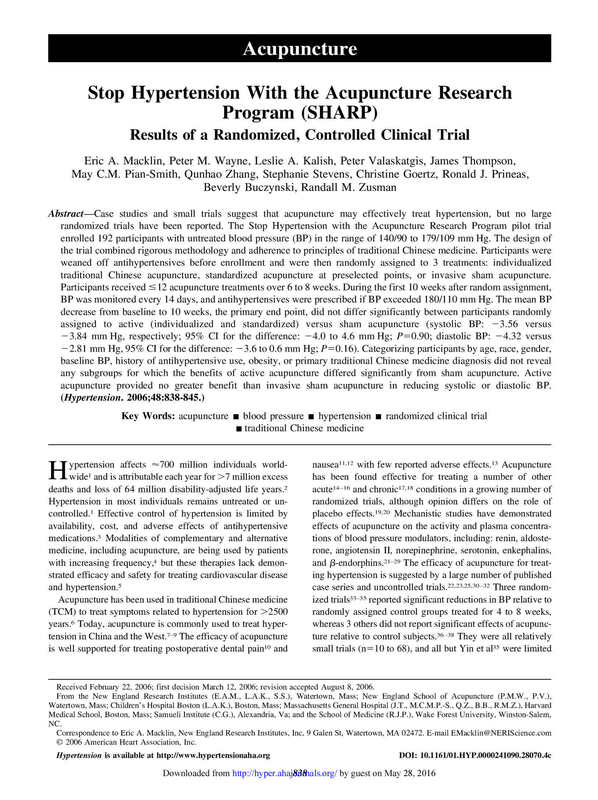 The mean BP decrease from baseline to 10 weeks, the primary end point, did not differ significantly between participants randomly assigned to active (individualized and standardized) versus sham acupuncture (systolic BP: −3.56 versus −3.84 mm Hg, respectively; 95% CI for the difference: −4.0 to 4.6 mm Hg; P=0.90; diastolic BP: −4.32 versus −2.81 mm Hg, 95% CI for the difference: −3.6 to 0.6 mm Hg; P=0.16). Categorizing participants by age, race, gender, baseline BP, history of antihypertensive use, obesity, or primary traditional Chinese medicine diagnosis did not reveal any subgroups for which the benefits of active acupuncture differed significantly from sham acupuncture. Active acupuncture provided no greater benefit than invasive sham acupuncture in reducing systolic or diastolic BP. Revision received March 12, 2006. Access to SAR's library of Evidence Based Assessments for acupuncture is a key benefit of membership. Click the image to the left for a sample of page selections. Also included in the library are 1-page handouts that summarize the research related to each condition. These handouts are designed for practitioners to give to patients or for other informational purposes. In the field of acupuncture research there is an implicit yet unexplored assumption that the evidence on manual and electrical stimulation techniques, derived from basic science studies, clinical trials, systematic reviews, and meta-analyses, is generally interchangeable. Such interchangeability would justify a bidirectional approach to acupuncture research, where basic science studies and clinical trials each inform the other. This article examines the validity of this fundamental assumption by critically reviewing the literature and comparing manual to electrical acupuncture in basic science studies, clinical trials, and meta-analyses. The evidence from this study does not support the assumption that these techniques are interchangeable. This article also identifies endemic methodologic limitations that have impaired progress in the field. 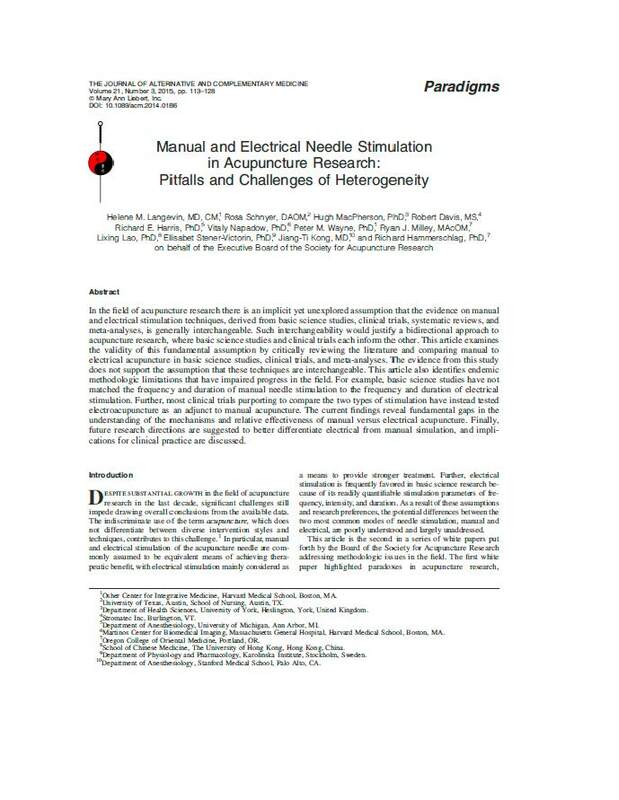 For example, basic science studies have not matched the frequency and duration of manual needle stimulation to the frequency and duration of electrical stimulation. Further, most clinical trials purporting to compare the two types of stimulation have instead tested electroacupuncture as an adjunct to manual acupuncture. The current findings reveal fundamental gaps in the understanding of the mechanisms and relative effectiveness of manual versus electrical acupuncture. Finally, future research directions are suggested to better differentiate electrical from manual simulation, and implications for clinical practice are discussed. In November 2007, the Society for Acupuncture Research (SAR) held an international symposium to mark the 10th anniversary of the 1997 NIH Consensus Development Conference on Acupuncture. The symposium presentations revealed the considerable maturation of the field of acupuncture research, yet two provocative paradoxes emerged. First, a number of well-designed clinical trials have reported that true acupuncture is superior to usual care, but does not significantly outperform sham acupuncture, findings apparently at odds with traditional theories regarding acupuncture point specificity. Second, although many studies using animal and human experimental models have reported physiological effects that vary as a function of needling parameters (e.g., mode of stimulation) the extent to which these parameters influence therapeutic outcomes in clinical trials is unclear. This White Paper, collaboratively written by the SAR Board of Directors, identifies gaps in knowledge underlying the paradoxes and proposes strategies for their resolution through translational research. We recommend that acupuncture treatments should be studied (1) “top down” as multi-component “whole-system” interventions and (2) “bottom up” as mechanistic studies that focus on understanding how individual treatment components interact and translate into clinical and physiological outcomes. 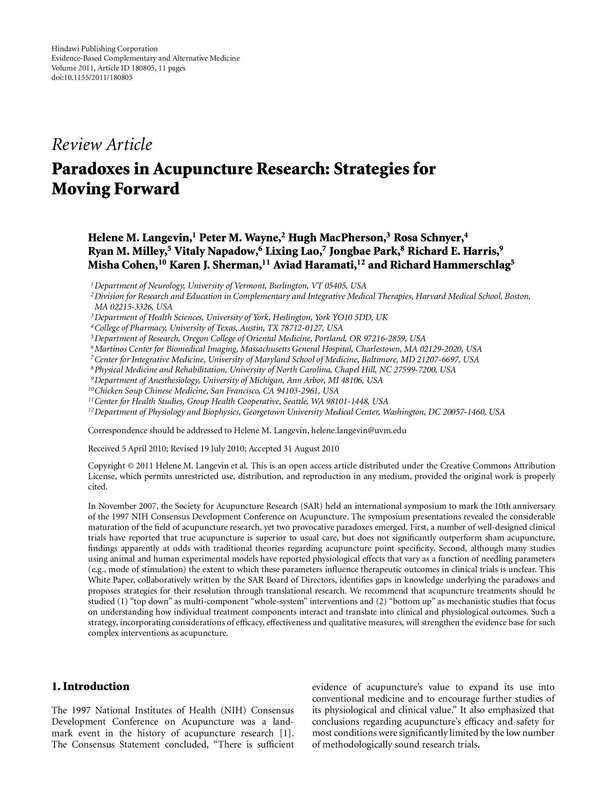 Such a strategy, incorporating considerations of efficacy, effectiveness and qualitative measures, will strengthen the evidence base for such complex interventions as acupuncture.